Branson is a wonderful place to spend the evening as it’s in this place where you can experience the best entertainment while enjoying your meal. Theater dining in Branson is one of the most enjoyable activities that visitors and locals alike want to experience as they spend a wonderful evening in Branson. Some of the awesome dinner and shows that you can enjoy in Branson include the Dolly Parton’s Dixie Stampede Dinner & Show, cruising with full course meal on Showboat Branson Belle, and A Tribute to George Strait Dinner Show. Dolly Parton’s Dixie Stampede Dinner & Show is a unique show experience with dinner set in a giant 35,000-square-foot arena featuring 32 magnificent horses, a stampede of Buffalo, hilarious racing pigs, Rumble In The Treetops lumberjack relay, equestrian feats, pageantry, thrilling horsemanship, romance and patriotism, all showcased in a friendly rivalry between North and South and served with a festive four-course dinner. This wonderful dinner and show attraction is shown in two popular vacation destinations: Pigeon Forge, Tennessee and Branson, Missouri. The world’s most visited theater dining in Branson, Dixie Stampede Dinner & Show presents its most-spirited adventure ever. This year, only at Branson location, you will see “Canine Capers,” an action-packed exhibition of “man’s best friends”! This stunt dog relay event includes agility course, Fly-Ball racing, and high jump in an exciting head-to-head competition. “Canine Capers” features rescue animals that are especially trained and sure to please every dog lover. Aside from enjoying spectacular pyrotechnics, dramatic sounds and lights, and different kinds of animals, you will get to see many talented women and stuntmen perform tricks on horseback. The combination of musical productions and special effects makes this show one-of-a-kind-experience you won’t forget. As you watch all the exciting shows performed right in front of you, you will be served with a four-course dinner delivered right to your seat. The festive dinner that you will enjoy at the show includes a whole rotisserie chicken, vegetable soup, barbecued pork, corn on the cob, a herb basted potato, and a homemade biscuit and a delectable dessert. Vegetarian meals are available on request and they include vegetable soup, garden vegetable salad, a herb basted potato, corn on the cob, a homemade biscuit, and decadent dessert. Dixie Stampede presents a rivalry competition that features the strength and agility of lumberjacks teams who are all skilled as they saw, chop, climb, and roll the log through a four-event relay. This friendly rivalry is between the North and the South. This Dixie Stampede event features 32 magnificent horses, trick riding, music and comedy, and a stampede of buffalo. This fabulous live entertainment is an incomparable country attraction in Branson. The finale of the show is performed with American songs written by Dolly Parton which features dazzling and illustrious costumes that make all the guests feeling with ultimate fun and excitement. 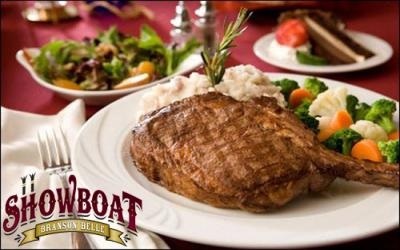 The Showboat Branson Belle cruising over Table Rock Lake is an unforgettable two-hour boat ride filled with live entertainment show and freshly prepared three course meal. America’s Most Entertaining Dinner Cruise debuts an All-New Show, Country On The Lake, a live concert and barbecue lunch adventure with Showboat Branson Belle starting May 27. This live concert onboard Showboat Branson Belle features rising country stars backed by a live band performing your favorite contemporary and classic country hits. “Celebrate” will return to Showboat Branson Belle this 2017 and will showcase the incredible vocal talents of Cassandre Faimon-Haygood and The Showmen along with the precise dance steps of Rhythm – The Fastest Feet West of Mississippi. Celebrate features a live band and is hosted by magician Christopher James. The showboat will host also special noon cruises with the Southern Gospel Music Cruises on August 31 to 31, 2017. These noon cruises include inspiring gospel melodies from the performers of Showboat Branson Belle followed by Southern Gospel greats singing your all-time favorites. Christened on April 13, 1995, Showboat Branson Belle has continued to entertain passengers for almost 20 years. This magnificent paddleboat has three decks where every passenger can have the chance to experience panoramic views of the beautiful Table Rock Lake. While you are enjoying a great time onboard the showboat, don’t miss shopping experience opportunity onboard and in White River Landing. At Layton’s Mercantile and McAdoo’s Boatworks, you’ll find a wide variety of ladies’ apparel, jewelry, accessories, along with the elegant and inspiration home décor items. You can also find favorite treats including special coffee, candies, Silver Dollar City jams, jellies, butters, preserves and more. The showboat also features a 12:00 pm lunch show “Made in the USA” that salutes the stars and stripes featuring the amazing voices of the all female four-member quartet The Showbelles along dynamic fiddler Dean Church and master pianist Julie McClarey. The host of the show is comedian and magician Christopher James with the support of The Showboat’s own live band The Castaways. The show’s musical presentations are dedicated to the USA that will make guests applaud with pride and excitement. A Tribute To George Strait Dinner Show is another fascinating show with dinner in Branson that pays tribute to a country music star, a true legend among legends. This great tribute show is Branson’s answer to a meal with the music that’s beautifully performed by the fantastic Gordy Wensel. With his talented assistant and wife Debby, Wensel connects the country music master to the delight of every diehard fan of George Strait in the audience. The show alone gives every audience a magical experience with great enjoyment of a scrumptious meal. Gordy and Debby have already toured the country and now enjoying a successful stint in Branson with their delightful dinner show. Debby will treat the audience on this tribute show to terrific songs and fun stories about the many female artists who’ve toured with George Strait. George Strait has been named by the CMA and ACM multiple times as Entertainer and Male Vocalist of the Year. He has also scored Album, Song, and Single of the Year time after time. He’s got also a Grammy for Best Country Album and racked up the plaques and statues from Billboard and TNN/Music City News, and proudly owns a National Medal of Arts, bestowed upon him by President George and First Lady Laura Bush. A Tribute to George Strait Dinner Show not just tempts you for a sumptuous meal, but the songs that keep fans returning time and again. Number one hits from George Strait include Check Yes or No, Write this Down, I Just Want to Dance with You, Ocean Front Property, I Saw God Today, Does Fort Worth Ever Cross Your Mind, All My Ex’s Live in Texas, and Love Without End, Amen. While enjoying delicious food, courtesy of “A Tribute to George Strait Dinner Show” in Branson, you’re sure to enjoy listening to some of country’s best songs. At the show, you’ll enjoy a fascinating dinner experience that includes your choice of entrée – Hawaiian Chicken, Hand Breaded Country Fried Steak, Prime Rib, or Jump Fried Shrimp. Each entrée is served with a salad, dinner roll, drink, and an ice cream sundae for dessert. Adult drinks are available for purchase. If you want to experience yourself with the best theater dining in Branson, see awesome show with dinner where you can enjoy the best entertainment while enjoying your meal.